There’s two big Roscommon-Mayo games coming down the tracks. The Roscommon footballers are chasing a football league semi-final place. SUNDAY’S CLASH OF Roscommon and Mayo holds huge significance. It may be a league game but it’s a huge battle between a Connacht team on the rise (Roscommon) against the established force in the province (Mayo). 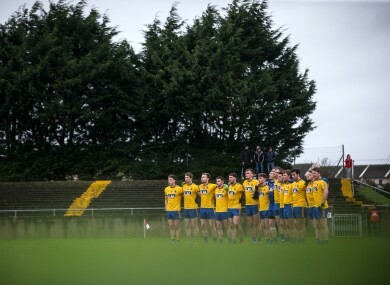 Roscommon are within touching distance of a semi-final place after a campaign where they began with the humble ambition of retaining their Division 1 status. Mayo, under new management, have endured a tough spring and the fear of relegation is closing. The counties also clash in the upcoming EirGrid Connacht U21 final on 2 April and their football collisions should ensure a cracking atmosphere in Dr Hyde Park on Sunday. “The way Roscommon are at the moment, we’re going well and you didn’t want to miss a session with the seniors. “It’s dog eat dog in training, playing training matches is harder than any other match. “In fairness to John Evans last year you couldn’t fault training but this year we are doing a lot more physical work. “You see the Dublin’s, Kerry’s, Mayo’s, Donegal’s, their intensity levels are up at a higher level. “We knew going into the year that the level we’ve been at the last 10-15 years wasn’t enough to be competing. “We decided we needed to get an advantage somewhere so we decided it was physically wise, fitness, strength, pushing ourselves to the best we can be. “I always felt for the last year or two, and last year when I was involved, we have the players. “From playing and against lads at minor the last couple of years I couldn’t see how other teams could be so much better than us. “I was thinking that we just need to get it together. I suppose we were hoping just to stay up and fight but we didn’t see it panning out the way we are now, sitting second in the table. “The Roscommon people and those in media are bringing that up but he hasn’t mentioned it at all. He’s created a great buzz. “The last two times we played them we beat them in the FBD league but that doesn’t really matter. We beat them in the FBD last year and we were gone by July while they could have won the All-Ireland. Email “Roscommon's stunning rise, McStay creating a buzz and Mayo's relegation fears”. Feedback on “Roscommon's stunning rise, McStay creating a buzz and Mayo's relegation fears”.